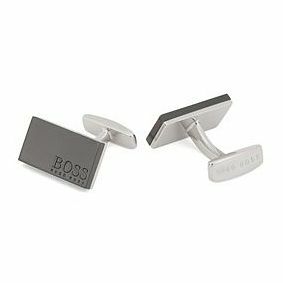 A stylish and contemporary set of cufflinks by BOSS, with a squared brass and a brushed metal finish for a perfect men's gift. BOSS Chris Men's Brass Cufflinks is rated 5.0 out of 5 by 1. Rated 5 out of 5 by Anonymous from Perfect gift for a loved one These cufflinks are a perfect gift for a loved one or for a personal treat. They are very classy and definitely help to exert a professional demeanour to a classic suit style. My partner styles them easily with both white and black shirts and the metallic finish gives them a suave finish. I would highly recommend these cufflinks.